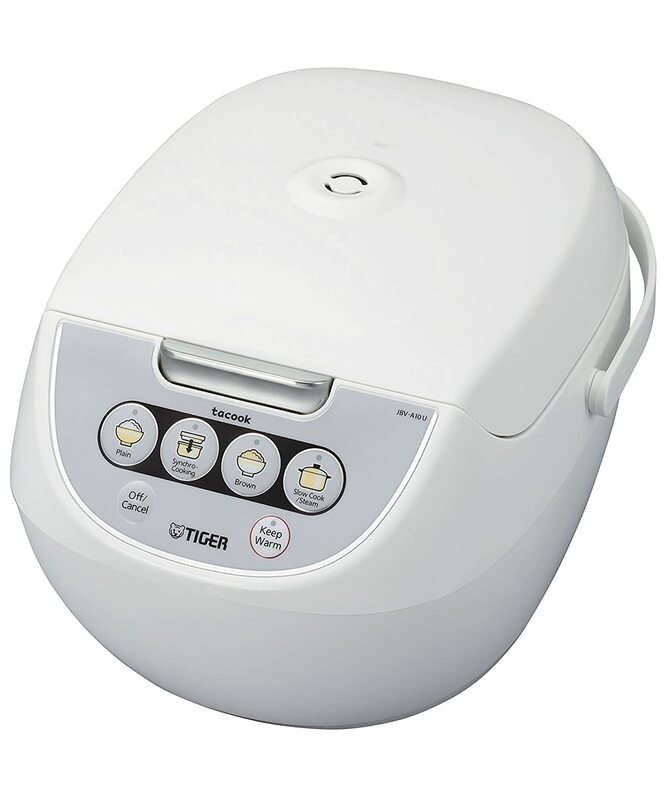 The Tiger JBV-A10u rice cooker has many special features. The syncro cooking function “Tacook” is a handy feature for those that like to cook rice and other foods in the same pot. This means it’s possible to cook a main dish and rice at the same time. The results is that you have a complete meal. This is a rice cooker that can cook 5.5 cups of uncooked rice, resulting in approximately 10 cups of cooked rice. The easy nonstick inner pan makes this rice cooker easy to clean and because the rice does not stick. This is a plus for families and individuals that like to make white or brown rice regularly. This rice cooker comes with four cooking setting that are called synchrony cooking. plain rice, brown rice, and overall slow cooking. It monitors cooking temperatures to create the perfect meal for you. The cooking plates does not affect the flavor of the foods. The TaCook Function cooks meats, chicken, vegetables, and seafood perfectly to go with your rice. It works by the steam from the cooking rice that rises to cook the food on the plate. Steam is released from the top through air vents so the rice and the meat or vegetables are never overcooked or mushy. It is simple, to make a meal first set the rice ready to be cooked. Then set the ingredients for the main dish and push the button and you’ll save energy and time. It has a large display that makes it easy to read. This means seniors or those that have trouble seeing letters and numbers will like the display. It comes with a spatula that does not stick, a measuring cup and even a cook book, as well as a BPA free cooking plate. Definitely a model to put on top of your list.